The modern game evolved from real tennis at the end of the 19th century, which was partly due to the invention of the lawn mower. Popularity and investment grew as the sport become more accessible, leading to improvements in equipment for which materials played a key role. Today, equipment manufacturers continually strive for improvements, while the International Tennis Federation take measures to ensure the nature of the game doesn’t change. Early 20th century lawn tennis rackets were key hole shaped and manufactured from a single piece of ash (Figure 1). The ash was boiled to make it pliable and bent into shape whilst still hot. These early rackets had weak throats and were prone to warping when wet; the issues were overcome by using additional materials, such as canvas and metal, to reinforce the problematic areas. As tennis grew in popularity manufacturers began to mass produce their rackets, using the latest materials and production techniques. 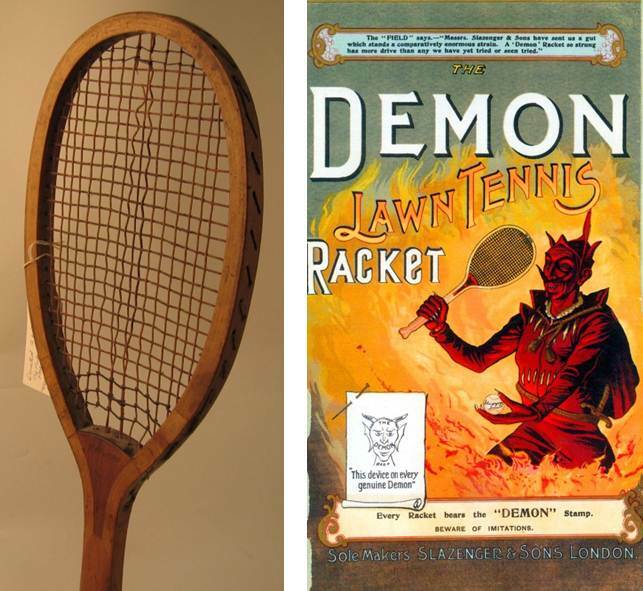 Figure 1: Demon tennis racket from 1900 with supporting advertisement. Images courtesy of Sheffield Hallam University. 1931 saw the introduction of the Dunlop Maxply, a laminated wooden racket famously used by John McEnroe and in production for 50 years (Figure 2). Despite its earlier use in other sports equipment, metal was not seen as a practical alternative to wood until the 1960’s. This was due to the difficulty in stringing a metal racket, an issue which was overcome by using grommets. In 1974 Howard Head invented the aluminium Prince Oversize racket (Figure 2). The larger head increased ease of play and the racket had a key role in increasing the popularity of the sport. Figure 2. 1981 Dunlop MaxPly and 1977 Prince Oversize. Images courtesy of Sheffield Hallam University. Manufacturers began experimenting with composite materials in the 1970’s, mainly due to their higher stiffness to weight ratio in comparison to metals. A significant early composite racket was the Dunlop Max 200G, which was introduced in 1980 and remained in production for 10 years. The Max 200G was manufactured by injection moulding nylon with short carbon fibres. Despite its many production advantages, the manufacturers were unable to use the injection moulding process to produce rackets with the same mass and head size as those produced using composite lay-ups. Currently, the majority of rackets are manufactured from composite lay-ups as this allows materials to be precisely placed for optimum stiffness and weight distribution. 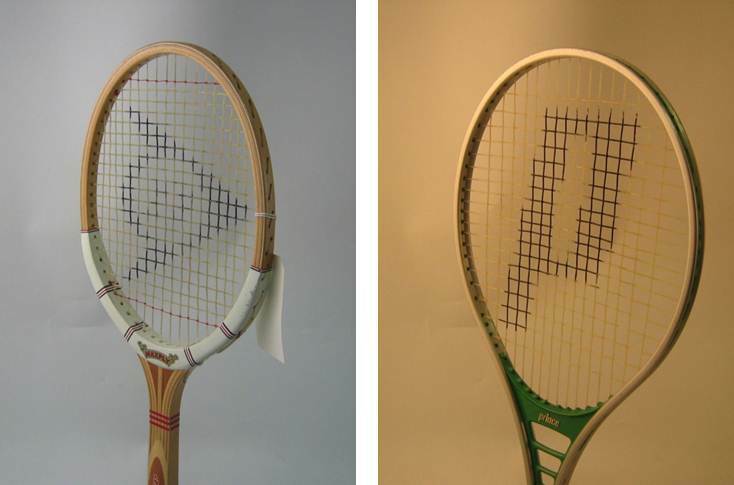 Rackets have been developed with complex geometries, which can influence the stiffness and aerodynamics (Figure 3). Figure 3. O-Port geometry in a Prince tennis racket. Image courtesy of Prince Sports. Modern composite rackets are around 30% lighter and three times stiffer than their state of the art wooden counterparts (Figure 4). A racket with the lower moment of inertia can be swung faster, whilst stiffness increases impact efficiency; both of these factors allow the player to increase the rebound velocity of the ball. The head size of these modern composite rackets is also around 40% larger, which increases ease of play. Figure 4. Changes in frequency (stiffness) and mass of tennis rackets since the 1970’s. Images from Haake et al. (2007). Rackets manufacturers are currently applying the latest engineering techniques to the development of tennis rackets. The aims are not only to improve performance but also prevent injury. Finite element analysis is a technique currently used in the development of tennis rackets (Figure 5), which allows new designs to be tested virtually using a computer. Figure 5. Finite element model of a tennis ball impacting a racket. Images courtesy of Sheffield Hallam University. This allows engineers to experiment with new geometries and materials, without the need to produce and test numerous prototypes. Another up and coming area is systemic testing on court, through the measurement of ball and racket movements in three-dimensions with high-speed cameras. In future, engineers will use a combination of both techniques, using finite element analysis to predict the effect of new racket designs on actual measured tennis shots. Dr. Tom Allen is speaker at ‘Materials for Winners’ – an international conference at Danish Design Center on Thursday, June 21st. Dr Tom Allen is a lecturer in Engineering Design at Sheffield Hallam University, where he leads a BSc (Hons) Sports Technology course. Experience fascinating examples of present and future materials and gain an insight into what they will mean to society and the individual. Visit the exhibition between the 2nd of April and the 10th of June 2012. This entry was posted in Material Innovation and tagged Carbon fibres, Composite lay-ups, Composite materials, Composite rackets, Materials and sport, Nylon, Techonolical innovation. Bookmark the permalink.